Kyle Vassell. Photo: Joe Dent/theposh.com. 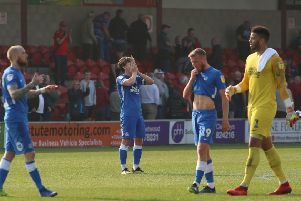 Grant McCann’s second signing as Peterborough United manager will be at the ABAX Stadium next week. McCann, who was officially appointed Posh boss on Monday (May 16), has agreed terms with a left-sided central defender. The player is expected to sign when he returns from holiday next week. Posh have released veteran defender Gaby Zakuani to make room for the new man, while Ricardo Santos will be placed on the transfer list if he fails to agree a new deal, if indeed one is offered by the club. All players, like Santos, who are entering the last year of their contract, are placed on the transfer list if they fail to agree fresh terms. McCann has also been busy in the last couple of days talking to those players. Goalkeepers Ben Alnwick and Dion-Curtis Henry, full-back Michael Smith, midfielders Harry Anderson, Erhun Oztumer, Jon Taylor and Jack Payne, as well as Santos are the players involved. McCann unveiled highly-rated right-back Hayden White as his first Posh signing at the press conference called to announce his own arrival. Posh striker Kyle Vassell is in talks with League Two side Crawley.